A dachshund belonging to a resident of Coves End Road in the Tokeneke section of Darien died from injuries after a fight with another animal, thought to be a large coyote in the area, according to the Tokeneke Association. In an email sent to members of the Tokeneke Association on Sunday (full text below), two dachshunds were let out by their owner at 6:45 p.m. on Jan. 18. One returned later with four-inch cuts on both sides of her body, which required surgery at a veterinary hospital. Family members searched for the other dog, but couldn’t find him. At 2:30 a.m., that dog returned and was taken to a veterinary hospital, but he died from his wounds. “[A] very large coyote has been spotted in recent days on Berry Road [Lane] early (7:30 a.m.) in the morning, behind Arrowhead Road [Way]/Winding Lane (9 a.m., this morning), and also by the Land Trust/Tokeneke Trail property,” the announcement said. The association is applying to get a permit from the state Department of Energy and Environmental Protection to trap and kill the coyote. In response to the recent attack on two dogs in Tokeneke by a coyote, please be advised the following details of the attack, recent sightings, and the Tokeneke Association’s response to trapping and eliminating this large coyote from the neighborhood. On Jan. 18, a resident on Coves End Road let her two dachshunds out at approximately 6:45 p.m. The resident has an invisible fence. One of the dogs came back in but the other dog never returned. Family members who searched extensively were not able to find him. The dog returned at 2:30 a.m. and was rushed to a veterinary hospital but ultimately succumbed to his wounds. The surviving dog sustained 4-inch cuts on both sides of her body, which also required surgery at the veterinary hospital. That dog will recover. Although the above attack happened around dusk, a very large coyote has been spotted in recent days on Berry Road early (7:30 a.m.) in the morning, behind Arrowhead Road/Winding Lane (9 a.m., this morning), and also by the Land Trust/Tokeneke Trail property. It is suspected that this large coyote is the one that attacked the dogs, although the attack was not witnessed. 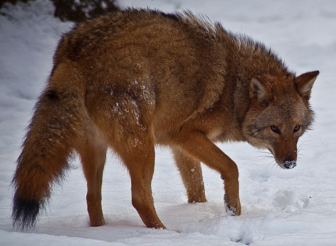 The Tokeneke Association will file a waiver with the State of Connecticut to obtain the necessary permit to trap and exterminate the coyote. 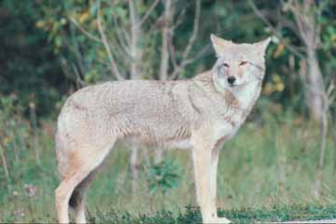 Because coyotes are endangered, the CT DEEP [Department of Energy and Environmental Protection] Wildlife Division requires a waiver and permit to allow the TA [Tokeneke Association] to hire a licensed nuisance wildlife control operator (NWCO) to proceed. State law requires the animal is trapped and exterminated on site. The Tokeneke Association will provide updates on this event as they occur.